You can find the link to the source code and executables from the bottom of this post. Did I mention that our sample application is simple? Well, here it is in our full glory. Our application is a simple Windows Forms client. 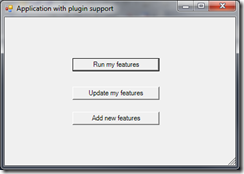 The application’s plugins are stored in binplugins –folder and they are .NET-assemblies. One assembly (dll-file) can contain multiple plugins for our application. To keep things simple, every plugin implements an IPlugin-interface. 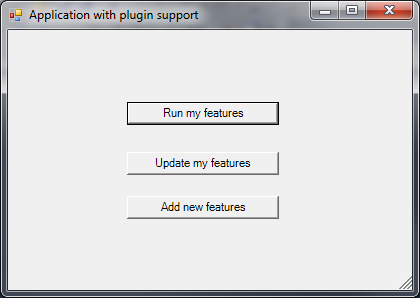 When you run the application and click the “Run my features”, it will execute all the functionalities provided by the plugins. When you click the “Update my features” and then the “Run” button, you’ll see how an existing feature has been updated on the fly. If you then click “Add new features” and then again “Run”, you’ll see how more functions has been added to the application. Behind the scenes the “Update my features” will replace the binpluginsplugin.dll-file with a plugin.dll from a binpluginsarchive-folder. “Add new features” will copy the plugin2.dll from the archive folder into the plugins-directory. For a more complicated application you can see the source code of the following irc bot, which allows the developer to add new commands (AuthenticateMe etc.) and irc event handlers (triggered by events like UserChangedTopic) without dropping the bot from the server. Existing commands and event handlers can be also modified on the fly. You can browse and download the sample application’s source from GitHub.